HYBRIDS - Most beekeepers in this country will have experienced the difficulty in managing bad-tempered colonies. Although the introduction of, for example, a pure strain of Italian bee results in a docile colony, upon natural replacement the new queen will mate with several drones (usually 8 to 10) from a radius of up to 6 miles, those drones usually being hybrids. This mating always results in subsequent generations being mildly bad tempered or aggressive, and usually spiteful and unpleasant to handle. Handling bees should be a pleasure, and there should not be a need to don a suit of armour when checking them. Hybrids have a very defensive character and have the reputation of stinging people for no apparent reason. When aroused, they can follow the beekeeper for considerable distances - 100 metres plus - most demoralising! It is vital that all beekeepers breed stock selectively to encourage traits such as good temper, non-swarming, disease resistance, etc, but it is of course much more practical to start with good stock that is suited to our climate. ITALIAN BEES - Adapted to cope with a longer summer and warmer climate than we have, Italian bees rear brood at a time when not really needed for our climate with its short honey flows, and they consume over the winter approximately double the amount of stores that native dark bees need. 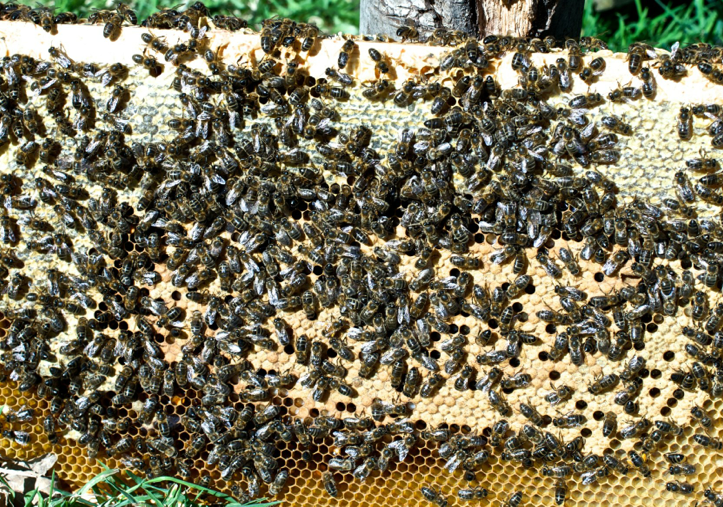 The swarming instinct in Italian and many other strains is considerable, resulting in too many swarms being thrown, and therefore a reduction in the honey crop from that hive plus the loss of a valuable queen. Below is an example of a comb of my pure native dark bees, picture taken in early spring, hence the absence of drone bees and pollen.